Linda Jones with Ryman Healthcare chief executive Gordon MacLeod at the opening of the new retirement village named after the former jockey. 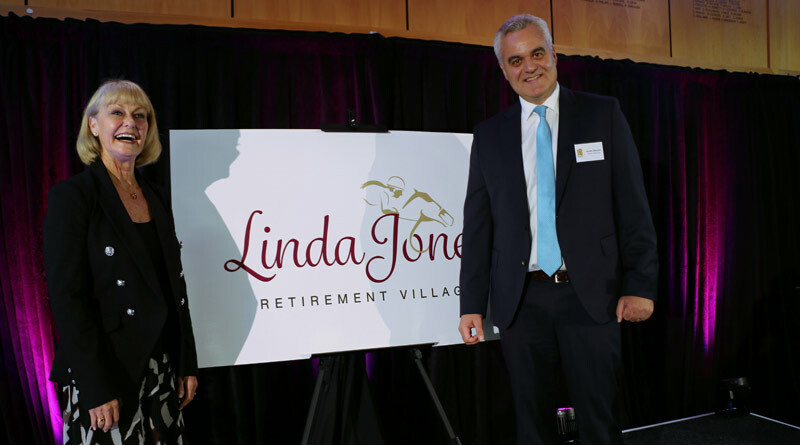 As the first woman to be inducted in the NZ Racing Hall of Fame, Jones is a true Kiwi icon who now joins a long list of great New Zealanders whose names have been lent to Ryman retirement villages, including Dame Kiri Te Kanawa, Bruce McLaren, Possum Bourne and Sir Edmund Hillary. Jones travelled from her home in Queensland to be at the naming ceremony and said she was delighted to lend her name to the new village in an area that was dear to her heart. The first residents will move in to the first townhouses to be completed next month. The village will offer a range of retirement living options with care tailored to each resident’s needs. It will include independent apartments and townhouses, serviced apartments and a care centre with resthome, hospital and dementia-level care options. Also included will be an indoor swimming pool, spa, gymnasium, hairdressing and beauty salons, café, movie theatre, library, a bar and billiards room.